Erica of Erica’s Edibles was our host for the Daring Bakers’ June challenge. Erica challenged us to be truly DARING by making homemade phyllo dough and then to use that homemade dough to make Baklava. 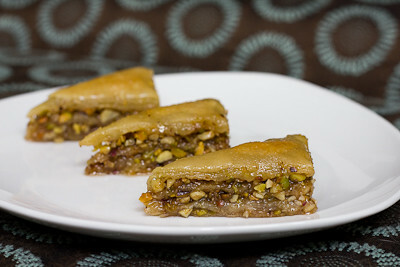 For those who are not familiar with baklava, it is a sweet rich pastry made with layers of phyllo dough and nuts sweetened with a simple syrup or honey syrup. 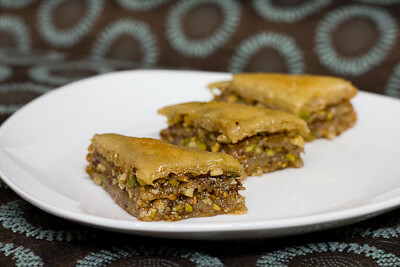 Baklava is widely known as a Greek dessert, but its origin has really never been pinpointed as many Middle Eastern countries also name it as their own. I was really excited to try this recipe. I was pretty thrilled when I made puff pastry from scratch for the first time, so trying my hand at homemade phyllo dough sounded like a great challenge! It was actually not as hard as I had expected. I think the hardest part for me was trying to get the sheets as thin as possible without tearing holes in them. Thankfully the baklava is forgiving and you can put several partial sheets together to form one complete layer and no one will ever know the difference! :) It was a lot of fun stretching it out and seeing it get super thin! Instead of an almond/walnut/pistachio nut mix, I simply used 1 cup of pistachios and 1/2 cup of almonds. I don't generally like nuts in baked goods, but I'll eat them in something like this. Unfortunately, I think I under baked my baklava a little bit. I took it out about 20 minutes early because it was starting to become golden brown on the top and I was concerned about it burning. As a result, I don't think my inner layers of phyllo got as crisp as they should have. Still, the baklava turned out great and we all enjoyed it. The recipe is definitely a keeper. Thanks Erica, for hosting this month's challenge. It was great to go beyond my comfort zone and try something completely new and challenging that I would never have thought to try on my own. While I probably won't ever make my own phyllo dough again (store bought is just too convenient in this case), it's nice to have another skill under my belt. 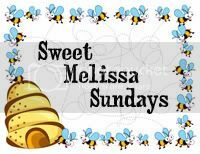 Make sure you check out the Daring Bakers' Blogroll to see how everyone else enjoyed this sweet and flaky treat. Use whatever means you have to get the dough as thin as you can. Here is a fantastic video on how to roll out your phyllo dough, using a wooden dowel, which worked perfectly for me. You may also use a pasta machine if you have one, or a normal rolling pin whatever works for you. 9. 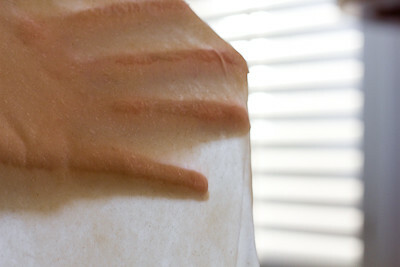 Set aside on a well-floured surface. Repeat the process until your dough is used up. Between each sheet again flower well. You will not need to cover your dough with a wet cloth, as you do with boxed dough, it is moist enough that it will not try out. Yay for homemade phyllo! Congrtas! Oh my gosh, homemade phyllo? That definitely counts as daring in my books.